There is no doubt that users love to store things. Hard drive manufacturers like Western Digital and Seagate keep making larger capacity drives (we’re up to 3TB in a single drive) and people just keep filling them up. Several years ago, filling a 3TB drive would be a daunting task. Today, with HD movies and high MP RAW photos, it’s a lot less unlikely to fill that 3 TB drive. The question is what do you do if you want to protect your data from drive failure? Aside from backing it up to another drive, the easiest method is to create a RAID array. The next question once you have your RAID array is how do you ensure you and people you want to share with have access to your data any time? In the past you would either have to leave your computer constantly on or build a dedicated storage server. Both of these options tend to use up a lot of power and in our Green minded society, seem undesirable. The other option is a dedicated NAS (Network Attached Storage) device. These typically don’t give you a lot of features besides a basic web management interface for configuring the RAID and setting permissions. Patriot decides to offer more bang for your buck and tosses in a boat load of bells and whistles into their new NAS, the Javelin S4. Read on for our full review and find out if the Javelin S4 is ideal for your data storage needs. Consolidate your digital media into a single storage location with the Patriot Memory Javelin S4 Media Server. 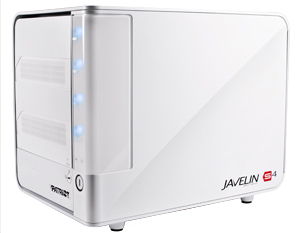 The Javelin S4 is the perfect media server to safely store and distribute all of your digital audio, video and images media via your home network or across the Internet to friends and family. Form and function is what makes the Javelin S4 the perfect digital media hub. With room to accommodate four 3.5-inch hard drives and additional external expansion via USB 2.0 and eSATA ports, the Javelin S4 can pack up to 12TB of storage capacity into a small form factor chassis. A customized operating system delivers superior serving capabilities to the Javelin S4. Integrated DLNA-compatible streaming, Apple iTunes server, Squeezebox Server and UPnP capabilities enable the Javelin S4 to seamless connect to PC, Mac and home electronics devices such as the Patriot Box Office and network-connected televisions and Blu-ray players.